While we understand that sometimes appointments have to be cancelled in an emergency, as a small business we do ask that you give us at least 24 hours notice where possible, prior to appointment cancellation as this will enable us to offer your space to another customer on our waiting list. We reserve the right to charge a fee of £25 for appointments missed or cancelled with less than 24 hours notice this will be payable prior to any future booking. Arriving 15 minutes (or more) late for appointments will in most cases require re-scheduling and a missed appointment fee of £25 will apply. 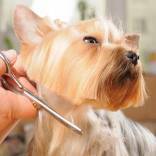 We are a small shop with only one groomer and two assistants. We are on a tight schedule, and this means if you are late dropping off or picking up this has a knock on affect for the rest of the day. With this in mind we kindly ask that you please try to be as punctual as possible. Please do not show up earlier than five minutes before your scheduled drop off or pick up time. If you are 15 minutes late for your scheduled pick up time, there will be a fee of £10 for every 15 minutes you are late.